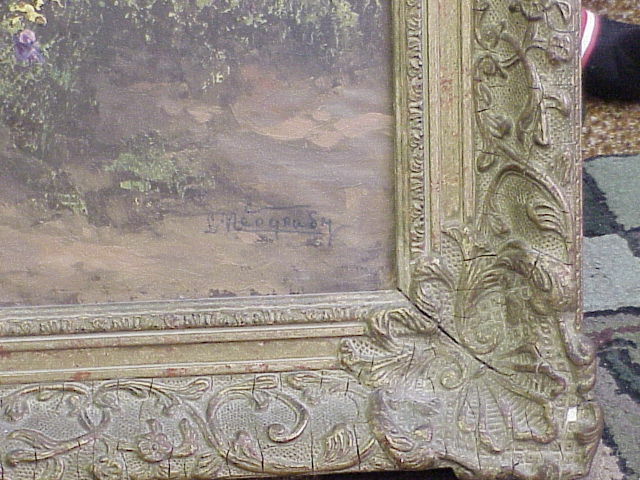 20th Century arts & crafts frame with carved corners. 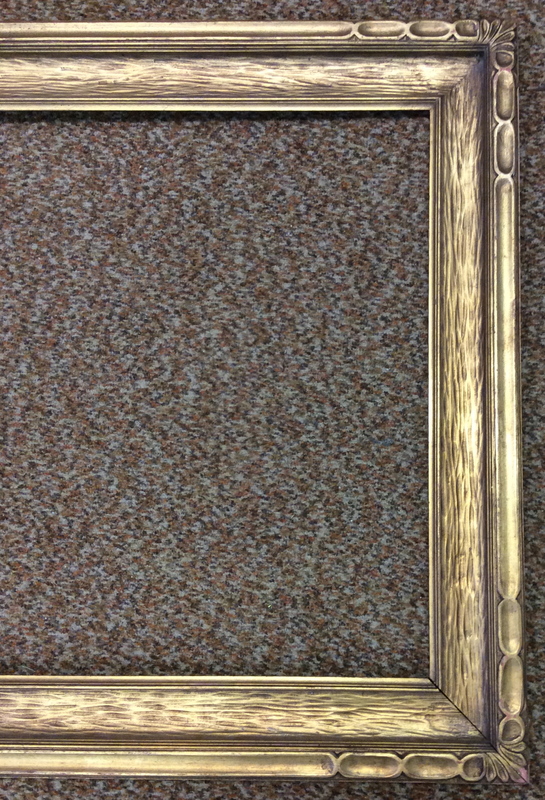 Frame is approx 2 1/2" and would house a 25x31" painting. Currently has a print in it to show how art would look. Some loss to paint & gilding. 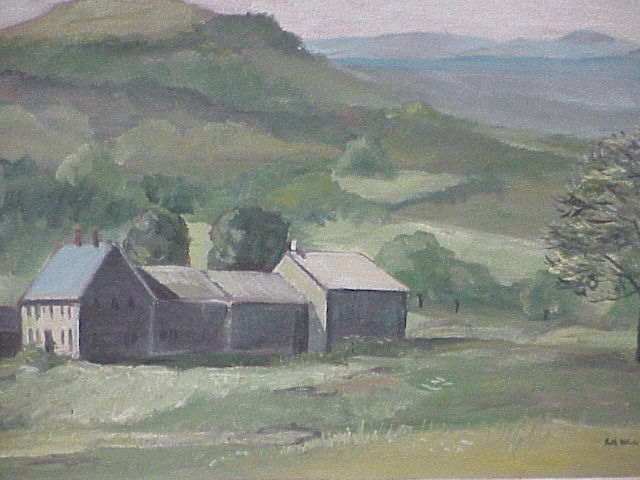 Illustrator Ruth Sanderson oil on canvas landscape painting from late 1960-70's. 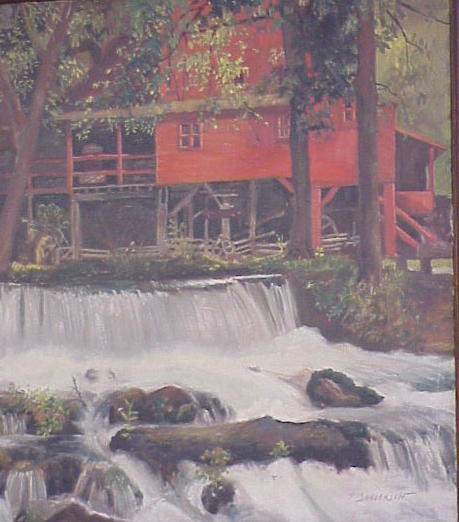 Barn scene with cascading waters. 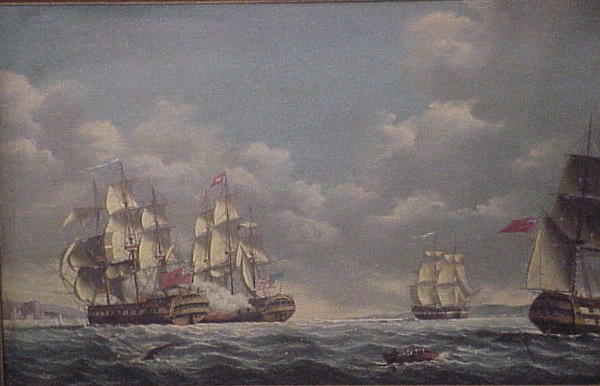 Ruth is known for her current day book illustrations. Original artwork of these illustrations sells in the thousands. Ruth graduated from Paier Art College in CT and belongs to Society of Illustrators, society of childrens' book writers and illustrators and western massachusetts illustrators guild. Oil on canvas is approx 25x30". 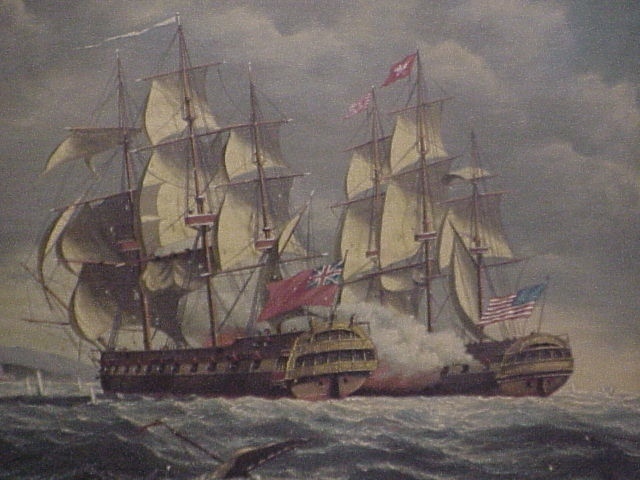 Exceptional 20th C marine art, Revolutionary War navy battle scene United States & Great Britain. Signed ll Salvatore Colacicco, fine detail, housed in 3" frame, painting is on panel and approx 23x35". 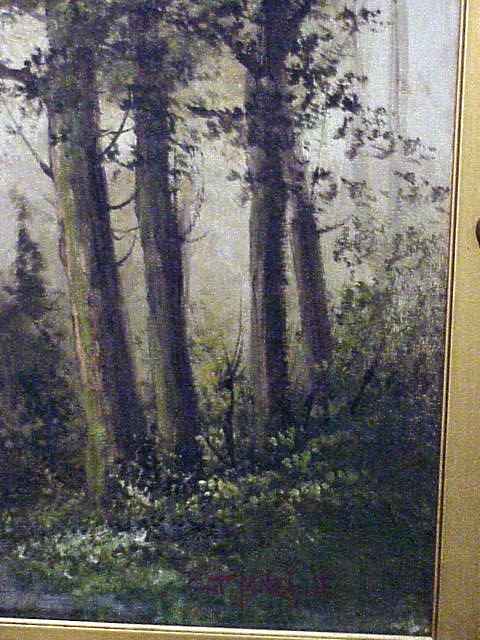 CT Mitchell was the pen name for Frederick Matzow of Meridan CT an artist who worked for two years doing Handel reverse paintings. Approx 14 1/2 x22” oil on board painting. 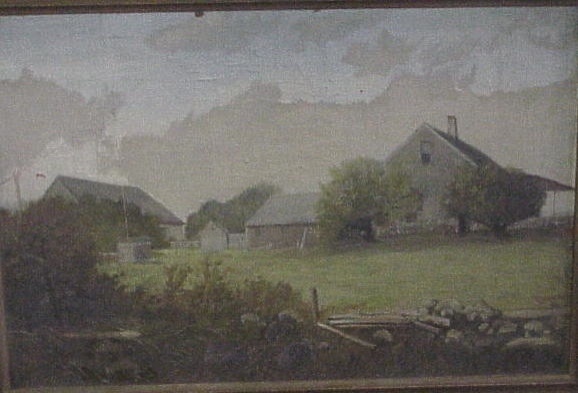 Attributed to Charles Drew Cahoon (MA 1861-1951), Cape Cod landscape with barn & house. 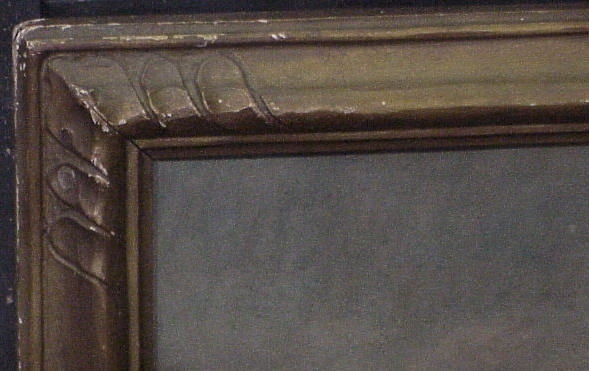 Housed in original frame, some minor paint loss to painting. 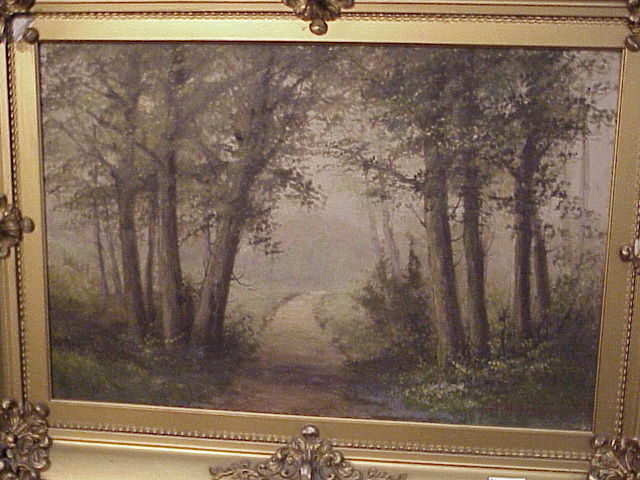 For nearly perfect accompany piece see Skinner’s American Furniture & Arts auction, sale #2431 November 1-2 2008. 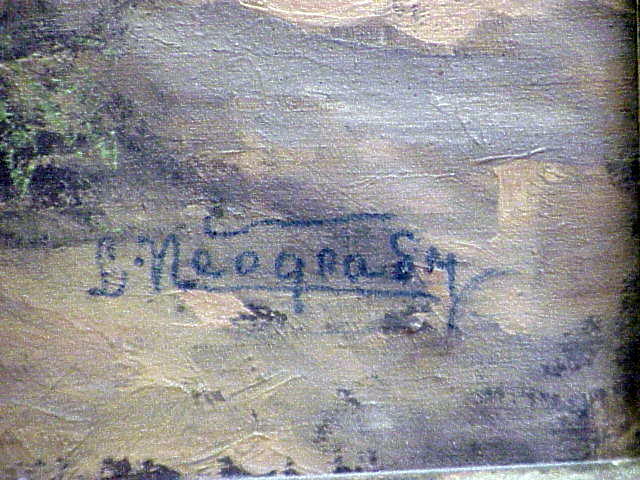 Laslo Neogrady Hungarian artist, many listings davenports etc. 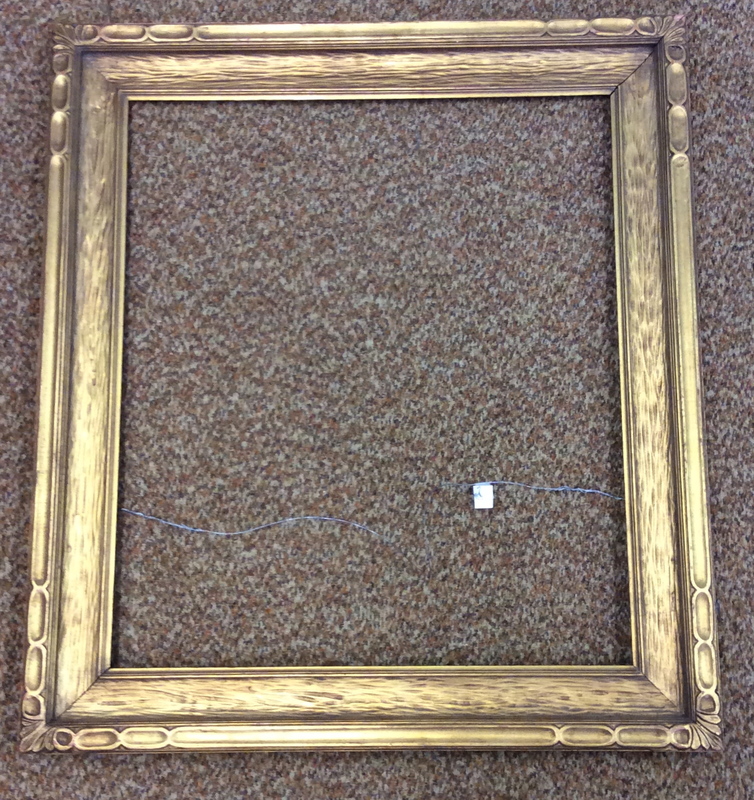 Set in original 3 1/2" frame which has some minor damage. Painting itself is 24x30". 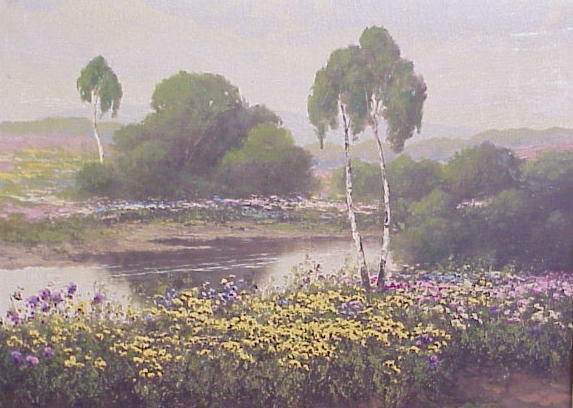 Beautiful river scene with flowers and trees. 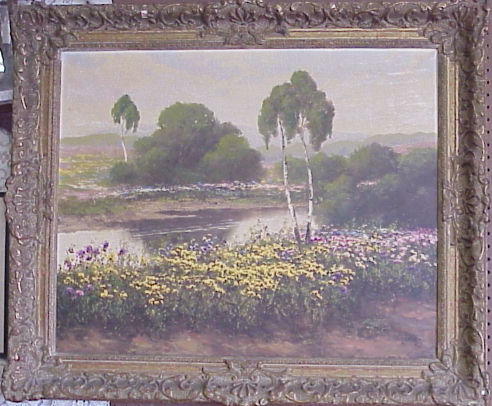 Nice depth to painting, muted use of greens with flower colors of purple & yellow standing out. 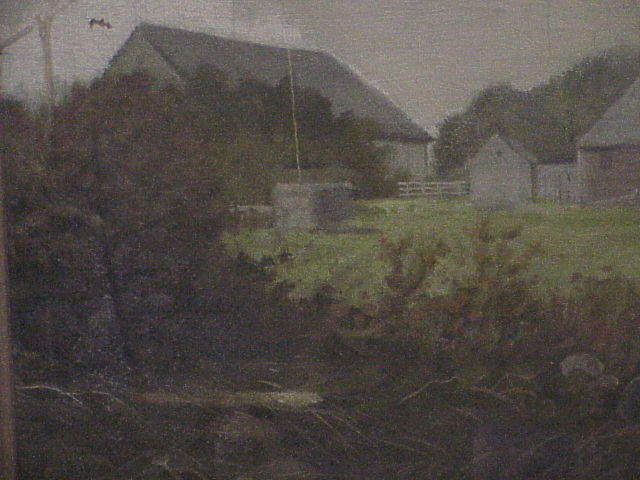 Oil on board landscape, winter scene with house by Florence Bishop. 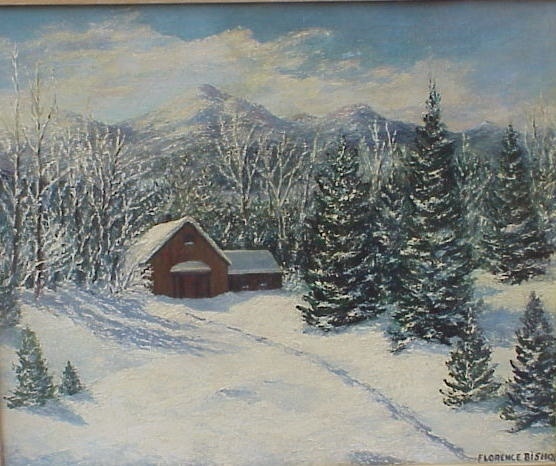 This painting is a Vermont winterscene, nice texture to the paint to give depth, well executed painting. 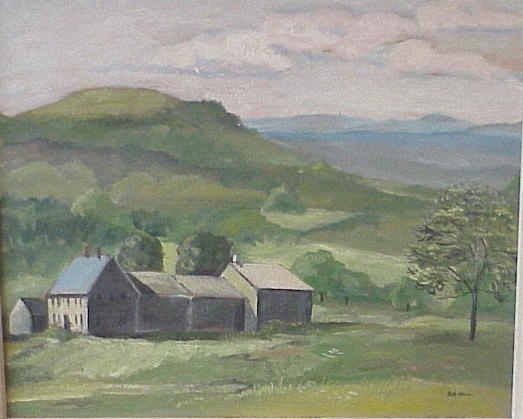 A regionalist painter, Bishop was a teacher at Emporia State University and listed in Susan Craig, "Biographical Dictionary of Kansas Artists (active before 1945)" She settled in Springfield Massachusetts heading a small art group which painted the country scenes of northern ma and southern vt & nh. Housed in original rustic frame. 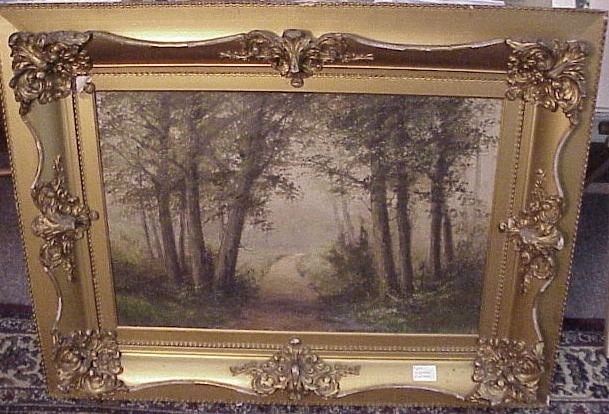 Very nice c1870 unsigned oil painting housed in original/period frame. 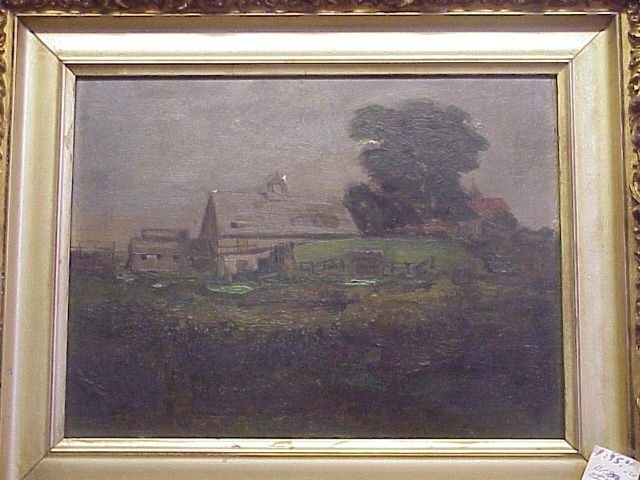 Nice landscape with house and barn, rolling hills and trees. 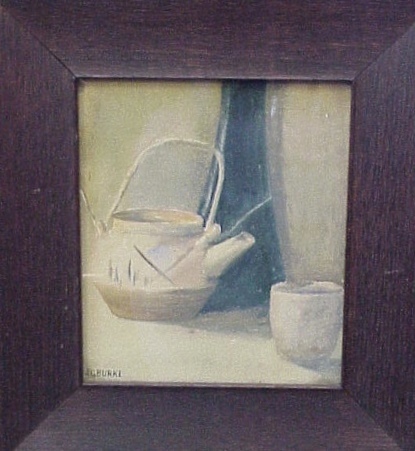 Painting measures approx 9x12" (sight) with 2 1/2" frame. There are 3 small paint loss spots. Nice impasto work in foreground to give texture to fields before barn & outbuildings. Housed in original oak arts & crafts frame is the period watercolor of Indian pottery. 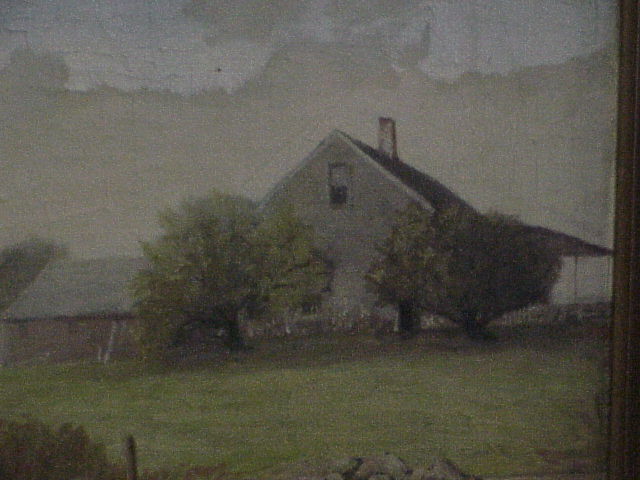 It is signed in lower right corner, JG Burke. Only reference I can find on JG Burke is for an Indian affairs government worker. This is a period piece which is well done and in subtle colors. The rich fumed oak frame is a approx 2 1/2”, overall size is 12x13”, watercolor itself is 6 3/4 x 8”. 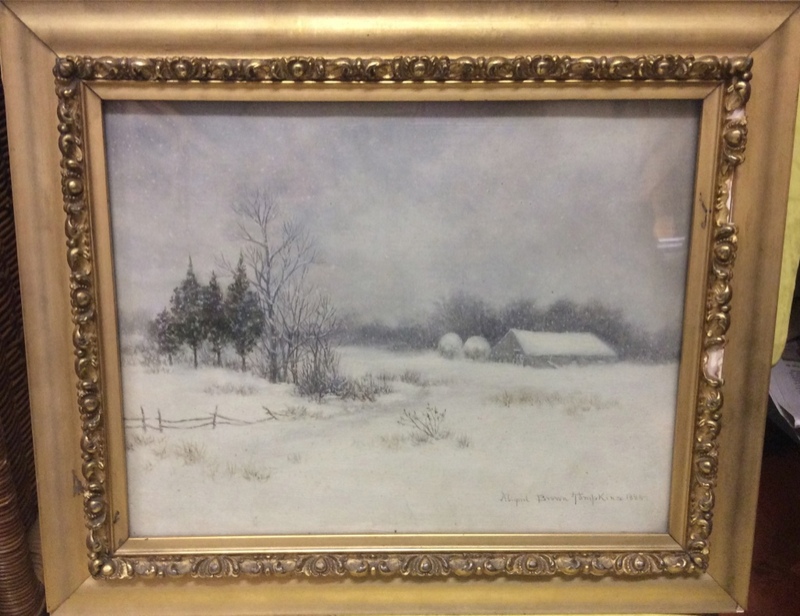 Winter scene oil on canvas in period frame, under glass. 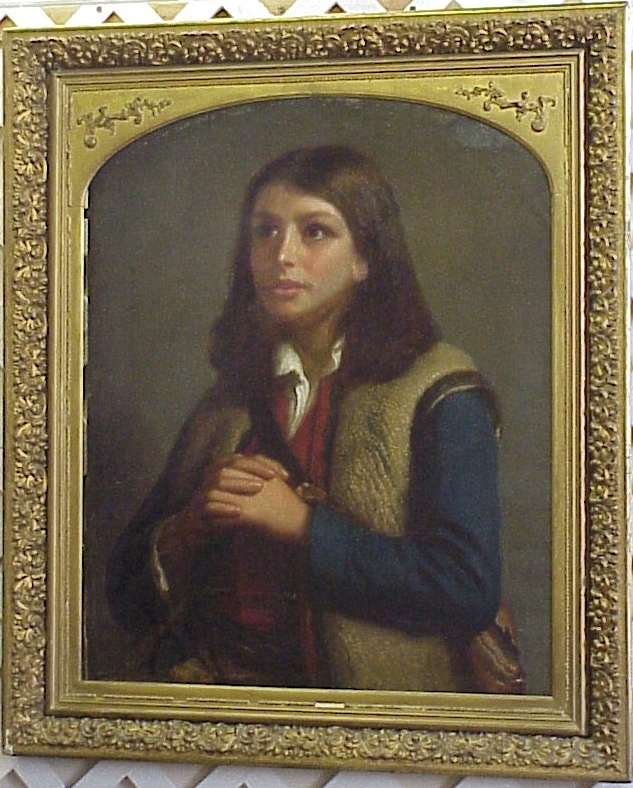 Signed and dated lr Abigail Brown Tompkins 1885. Painting itself is approx 7 1/2 x 9 1/2”, frame is 1 1/2” some loss to decorative gesso inner section. 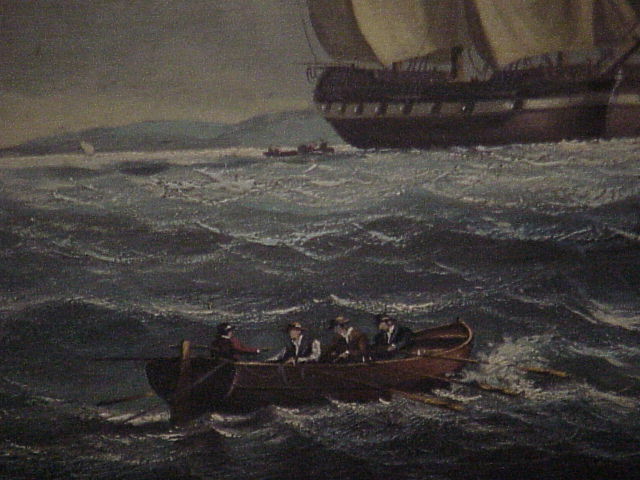 Ms. Tompkins is a listed New Jersey artist. We have had other works by the artist and we feel this is one of her better works we have seen. Nice palette work to give affects of falling and drifting snow. 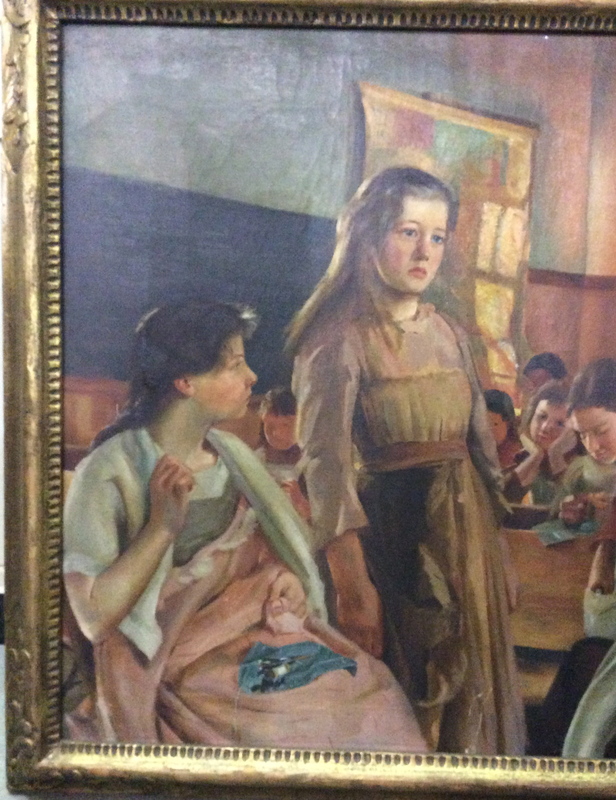 Very well executed oil on canvas painting of a girl’s sewing class. Unsigned there was a label on backside. 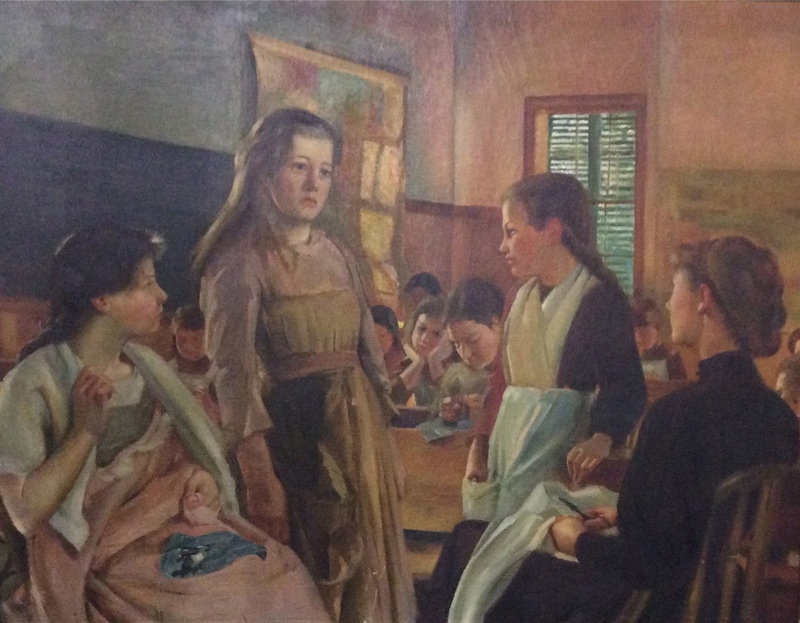 One girl is standing in middle of class perhaps showing off her sewing project, her new dress. 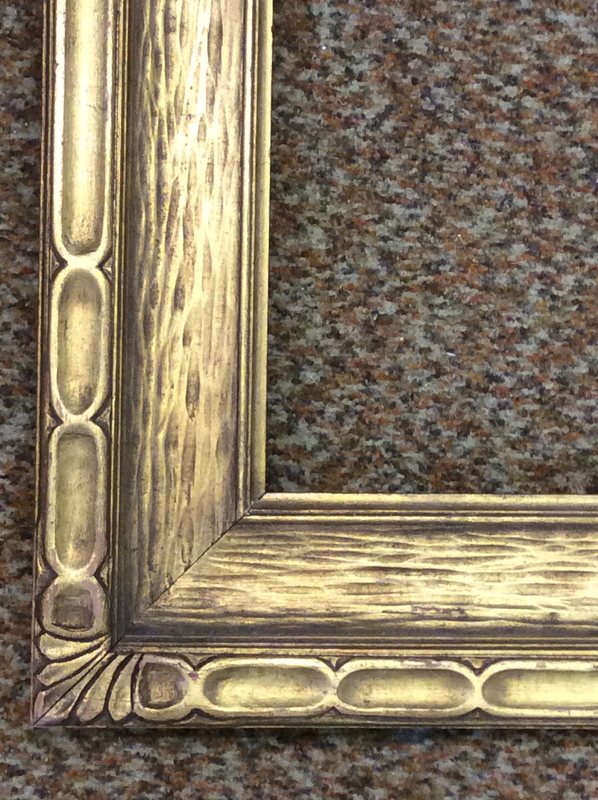 Hand carved, gilded period arts and crafts frame by Carrig Rohane. 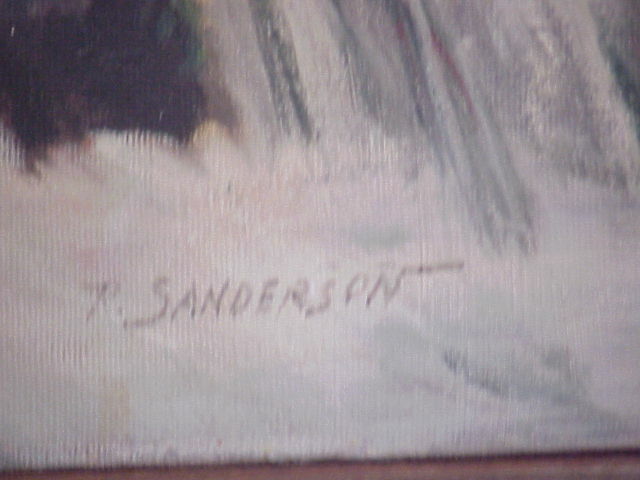 There are pencil marks on back but no signature. 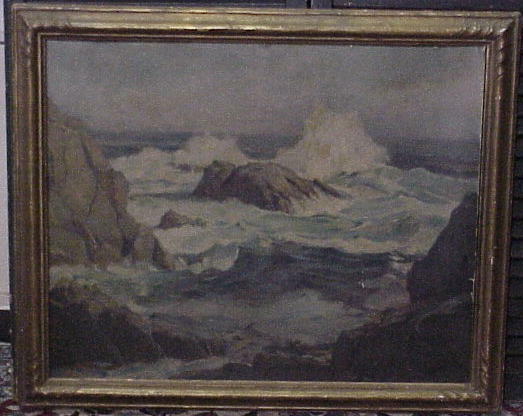 The painting is approx 28 x 36”, frame is 2 1/2” some loss to paint in corners. The quality of this painting leads me to believe it was done by a professional either illustrator art or fine artist as the Carrig Rohane frames were higher end. 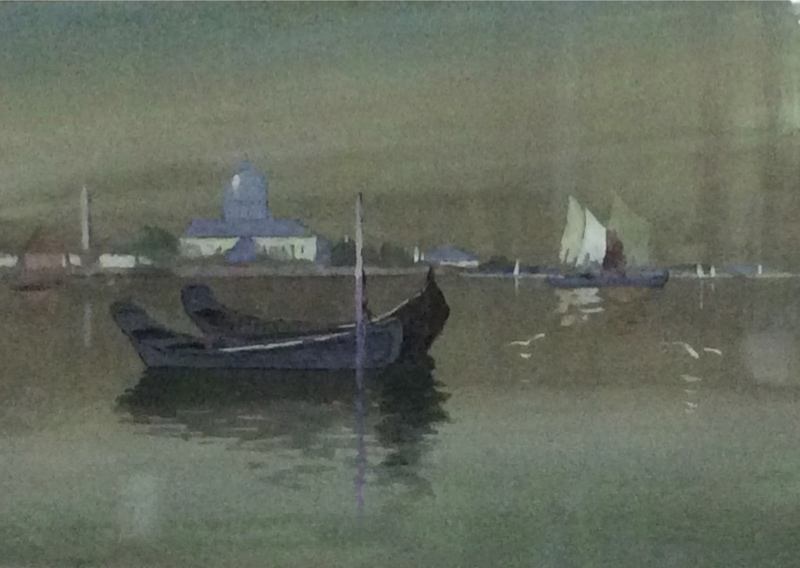 1907 Gouache watercolor of Italy harbor with domed building in background. 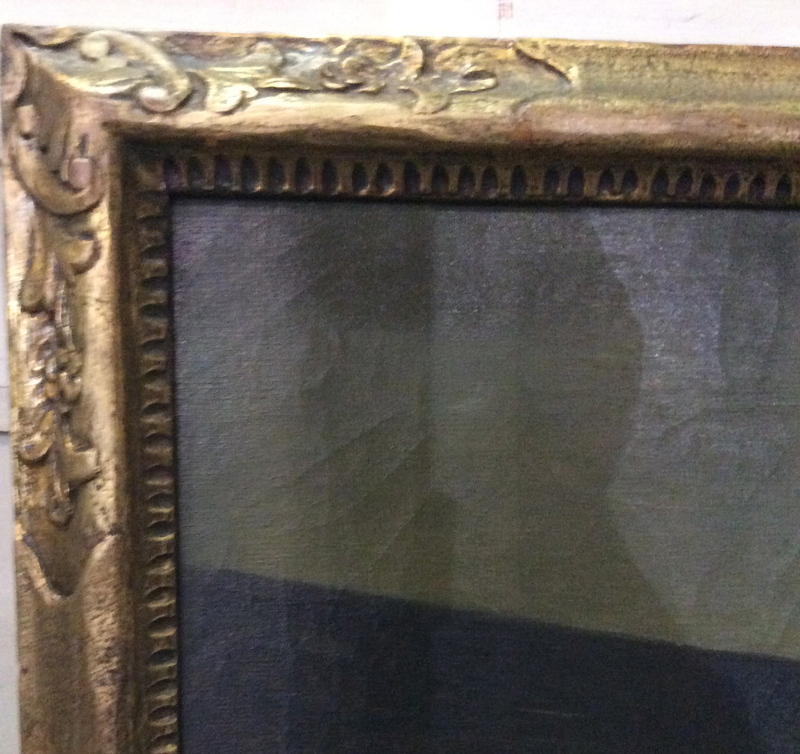 Estate purchased, so triple matted, antique oak frame. Not examined outside of frame. Signed and dated lr corner, can only guess on signature…M.R. 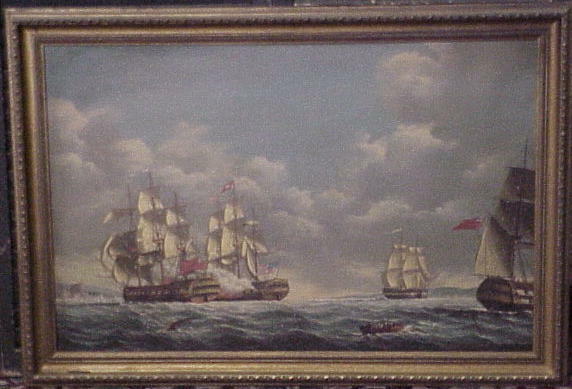 Delhome?Approx 9x14” image, overall with frame and mats 17x22”. 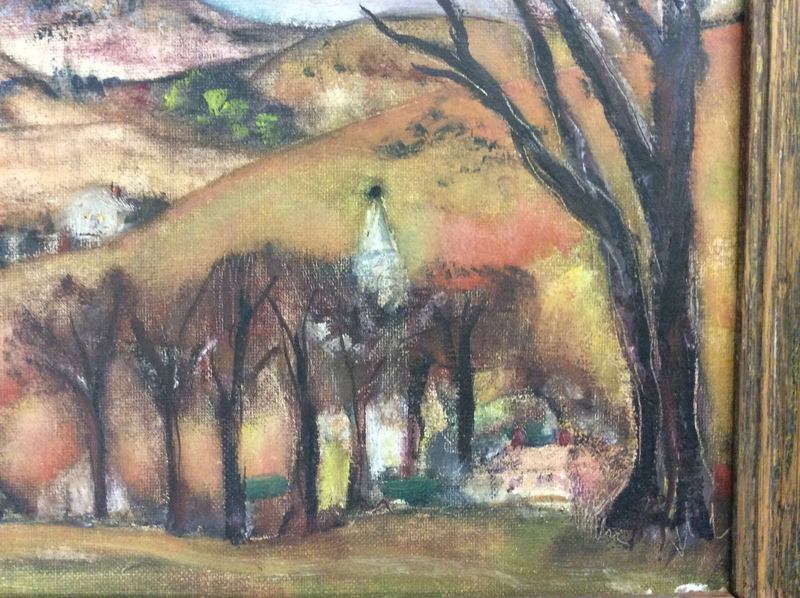 Oil on board landscape by WPA artist and instructor Marion Huse. A village and church steeple are beyond tree line, mountains in background. 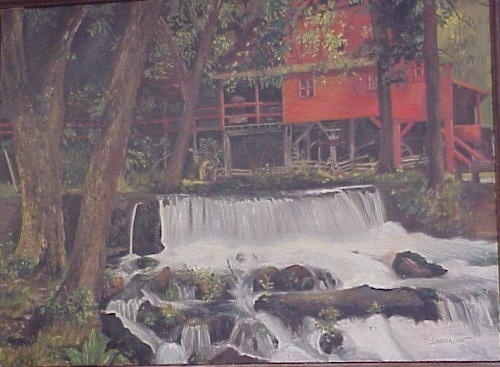 Probably a painting from her Pownal Vermont time (1940’s). 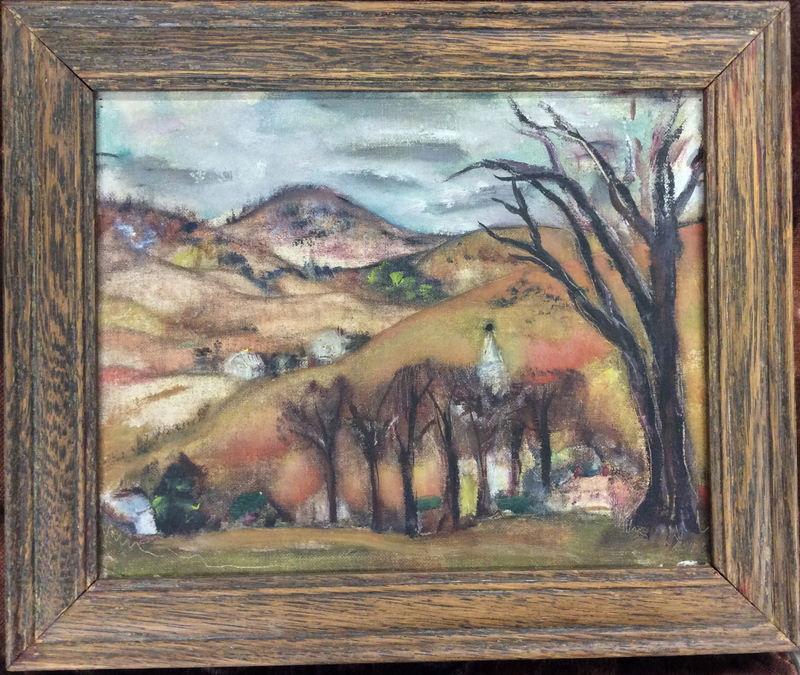 Housed in antique oak frame with what appears to be artist paint highlights. Signed on black backing paper Marion Huse.